Planting and showcasing your favorite plants and flowers is all the more fun with our attractive Amish Eco Friendly Square Sleeves Planter Baskets. These handmade baskets are just right for a number of areas. Made of recycled plastic that is UV treated makes these planter baskets great for use indoors or outside. Don't worry about colors fading from this plastic material. Set up these baskets by the pool, on the porch, in your yard or anywhere inside. Plastic milk jugs and detergent bottles are kept out of our landfills with each eco friendly basket you buy. Browse our entire collection of handmade, eco friendly baskets from the Indiana Baskets Collection. You're sure to find the perfect gift for a family member or friend who is committed to going green. 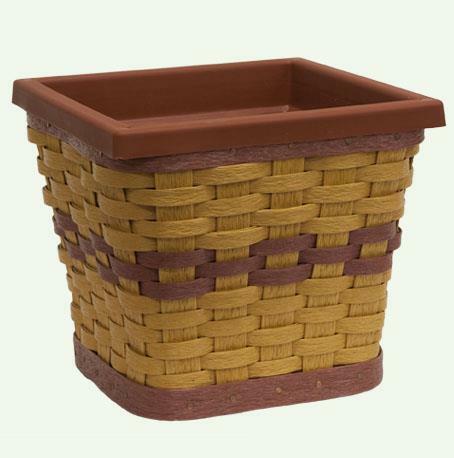 A variety of custom colors is available for the Square Sleeves Planter Basket. Choose just the right shades to match your decor. Consider more eco friendly gifts from our Unwined Candle Collection and our handmade Goats Milk Soap Collection.